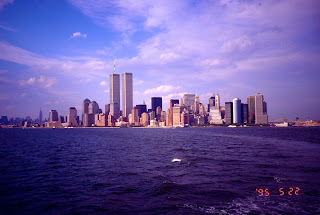 These were taken from a ferry headed to Ellis Island for an engagement I had there. I have many photos of the towers under construction at various stages I used to take from a pier in Brooklyn, and I'll post them when I find them. 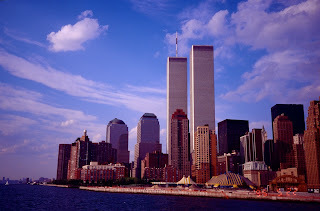 There are so many memories from the foundation of the towers, to many meetings in the buildings, dinners and drinks on the top floor, and of the sweeping view of New York harbor, not to mention the small church where I was married, which was obliterated. 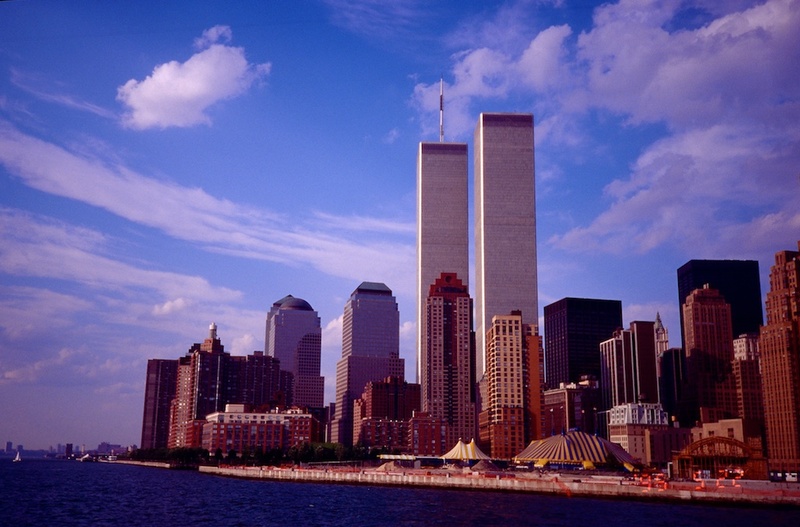 Ten years on and 9/11 resonates just as painfully as it did in 2001. It is a wound that may never heal, even with the death of Bin Laden, as the struggle continues to play itself out. 9/11 is a dividing line in time, from which there is a clear before and after. I recall the night of the millennium and how magnificent celebrations around the world occurred without the slightest thought of terrorism. The innocence of that moment is gone forever, as we live in a world of unending wariness and security precautions previously unimaginable. In this there is no end in sight as we must remain ever vigilant, even as we have largely decimated Al Qaeda and the city and country bounced back. The cost in blood and treasure has been enormous, as war continues in remote outposts in Afghanistan. So much of the burden of our security rests on so few shoulders, unlike past conflicts, and indeed never have so many owed so much to so few. We must never forget the front line troops and their sacrifice, and all those innocents who perished on that awful day. Thus we must keep those images vividly in mind, as awful as they are, so that we never forget. It is not something to "put behind us," as some would have it, bu to remember always. Never forget.